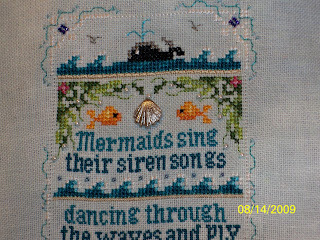 I finished Just Nan's "Sirens of the Sea" last night. I have been away from my blog for awhile. Alot of stuff has happen here lately. I moved back to Anchorage, Alaska and I'm back working up here on the same project. Hopefully, this time it will be longer than last time. am addicted to quilting. I have been to every quilt store in Anchorage and Eagle River. 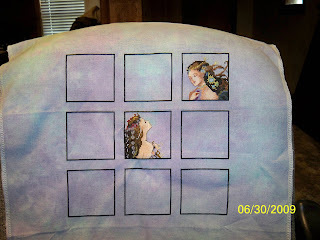 I'm meeting with a lady on Saturday to do my quilting on my second quilt that I finished. It is really fun to learn something new. 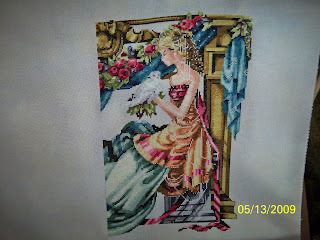 I have a small wall hanging that I'm going to do this weekend so I can learn how to applique. Well let me get to work. 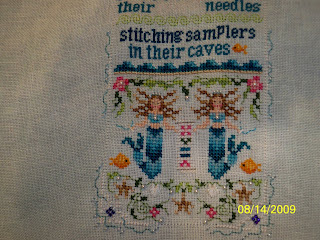 Here is Rachel's RR, I stitched "Shimming Mermaid" in my block. I hope you like you. I have some more progress on Athena. My goal is to finish by June 15th. June 15th is when the Mirabilia RR starts off. If I can't finish her by then I will work on her when I can. I'm off to the New Orleans Jazz Festival this weekend, with my best friend, niece and DBF. Also tomorrow we have friend coming to met us. The Jazz Festival is this huge event with different singer from all kinds of music. We are going to see Bonnie Raitt, Sugarland and many more today. Tomorrow we are seeing Dr. John and Bon Jovi (my favorite). I hope to bring back lots of pictures and I'm sure we will have so much FUN!!!! I have a new Great Nephew. He weighs a whopping 9lbs 11 ozs and his name is Emil Joseph. He is beautiful. My niece said it was a piece of cake delivering him, but she couldn't get over how big he is. He will be welcome by his big brother Dalton Vance. Dalton didn't want to leave the hospital last night, he wanted to stay with his new baby brother. Dalton is so cute with him. I think they will be able to come home today sometime. This makes 4 grandchildren for my Sister, 2 boys and 2 girls, she is so excited. 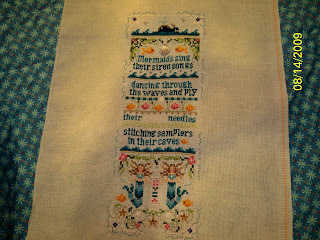 I need to find something to stitch about grandchildren. Well thats it for now! 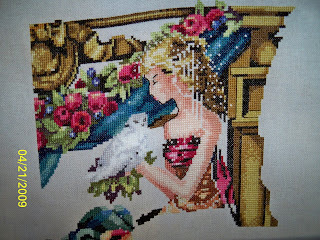 Here is my progress so far on Athena, I started back on her Easter weekend. She is looking good so far. 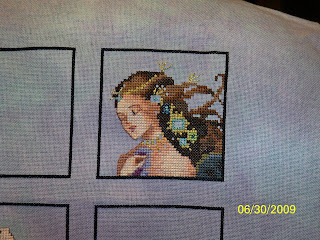 I'm really enjoying stitching her. As you can see, I have done the stitchingon the left side, a little backstitching and no beading as of yet. She is being stitch on SW Desert Sky 32 count. Well I'm back in Louisiana. Actually I have been back a couple of weeks now, but it has been crazy trying to get things organized and settle. I have been depressed some, I have never been without a job and money is running out. My umemployment is not being process yet, boy what a pain. Well after a dealing with that and trying to get everything moved back and getting the house clean, I finally can sit down and start stitching again. I'm working on Bentcreek's Snapperbits and I'm almost finished. I have deceide to Moderate a Mirabila RR for 2009, if you are interest in a Round Robin go to:http://twbbroundrobins.yuku.com/directory, look for Mirabila 2009 and get all the information there. 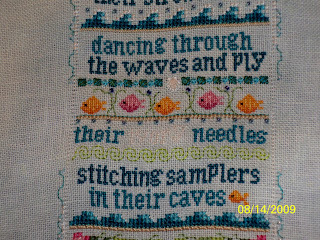 We are looking for stitchers. I'm a 40 something year old,single mom, that enjoys stitching and sports. I also have 2 beauitful Cocker Spaniels. Mirabilia's Athena "Goddess of Wisdom"